Start off your visit on the 14th (Fri): contemplate the long history of Hagios Demetrios, get engrossed in the history at Museum of Byzantine Culture, take in panoramic vistas at White Tower of Thessaloniki, then contemplate the long history of Arch of Galerius, and finally make a trip to Aristotelous Square. On the 15th (Sat), you'll have a packed day of sightseeing: take an in-depth tour of Archaeological Museum of Thessaloniki and then explore the stunning scenery at Baseline Canyoning. For maps, photos, where to stay, and more tourist information, read our Thessaloniki holiday planner. If you are flying in from Greece, the closest major airport is Thessaloniki Macedonia International Airport. In July, daily temperatures in Thessaloniki can reach 38°C, while at night they dip to 24°C. Cap off your sightseeing on the 15th (Sat) early enough to travel to Paleokastritsa. Heartily dedicated to tourism, Corfu's popular resort town of Paleokastritsa lures vacationers with lavish hotels and beaches surrounded by a hilly countryside of olive groves and fragrant fruit orchards. 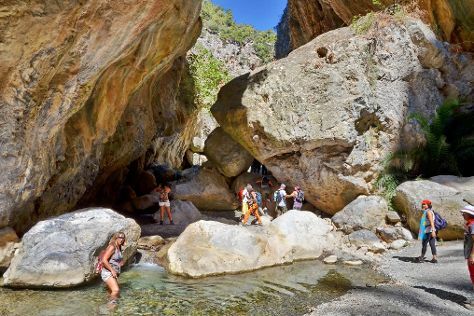 Kick off your visit on the 16th (Sun): take in the dramatic natural features at Kaiser's Throne, experience rural life at Corfu Donkey Rescue, and then kick back and relax at Paleokastritsa Beach. For where to stay, photos, more things to do, and other tourist information, read our Paleokastritsa trip itinerary builder. You can do a combination of flight and taxi from Thessaloniki to Paleokastritsa in 2 hours. Other options are to do a combination of car and ferry; or take a bus. In July, daytime highs in Paleokastritsa are 38°C, while nighttime lows are 24°C. Finish your sightseeing early on the 17th (Mon) to allow enough time to travel to Paxos. To find other places to visit, reviews, where to stay, and tourist information, read our Paxos trip planner. Drive from Paleokastritsa to Paxos in 5.5 hours. In July, daytime highs in Paxos are 35°C, while nighttime lows are 24°C. Wrap up your sightseeing on the 18th (Tue) early enough to travel to Ithaca. Ithaca is a city in the Southern Tier-Finger Lakes region of New York. On the 19th (Wed), admire the majestic nature at Robert Treman State Park, admire the natural beauty at Cornell Botanic Gardens, and then admire all the interesting features of Cornell University. To find other places to visit, reviews, ratings, and other tourist information, you can read our Ithaca trip itinerary maker. The Route module can help you plan travel from Paxos to Ithaca. You'll gain 7 hours traveling from Paxos to Ithaca due to the time zone difference. Prepare for a bit cooler weather when traveling from Paxos in July: high temperatures in Ithaca hover around 32°C and lows are around 17°C. Finish your sightseeing early on the 20th (Thu) so you can travel to Athens. Get outdoors at Glyfada Beach and Mount Lycabettus. There's still lots to do: delve into the distant past at Acropolis of Athens, admire the masterpieces at Benaki Museum, get engrossed in the history at National Archaeological Museum, and pause for some photo ops at Temple of Olympian Zeus. To see photos, more things to do, and more tourist information, read Athens trip itinerary planner. Explore your travel options from Ithaca to Athens with the Route module. You'll lose 7 hours traveling from Ithaca to Athens due to the time zone difference. Prepare for a bit warmer weather when traveling from Ithaca in July: high temperatures in Athens hover around 39°C and lows are around 27°C. Wrap up your sightseeing by early afternoon on the 25th (Tue) to allow time for travel to Lindos. You'll enjoy a bit of beach vacationing at Faliraki Beach and Tsambika Beach. Get outdoors at Lindos Beach and Agathi Beach. Get out of town with these interesting Lindos side-trips: Easyboat - Boat Rental (in Faliraki), Submarine Tours (in Rhodes Town) and Artistic Village Contemporary Art - Art gallery & Museum of Ceramic Art (in Kolimbia). There's still lots to do: explore the ancient world of Acropolis of Lindos. To see where to stay, ratings, more things to do, and more tourist information, read our Lindos travel planner. Traveling by combination of flight, taxi, and bus from Athens to Lindos takes 5 hours. Alternatively, you can do a combination of ferry and bus. When traveling from Athens in July, plan for slightly colder days in Lindos, with highs around 35°C, while nights are about the same with lows around 28°C. Wrap up your sightseeing on the 29th (Sat) to allow time to travel to Mirtos. To find reviews, ratings, photos, and tourist information, you can read our Mirtos vacation builder. Use the Route module to find suitable travel options from Lindos to Mirtos. In July, plan for daily highs up to 34°C, and evening lows to 26°C. Finish your sightseeing early on the 30th (Sun) so you can travel to Heraklion. 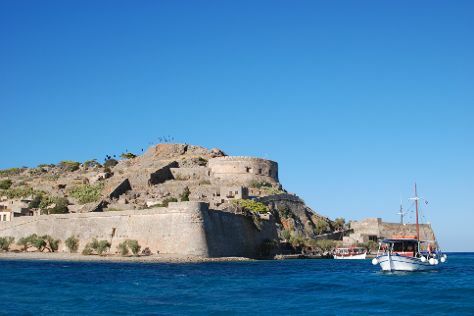 Visiting Spinalonga (Kalydon) and Matala beach will get you outdoors. 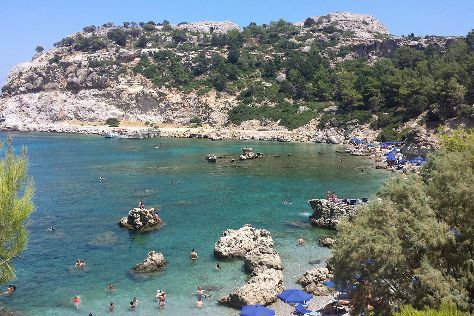 Explore the numerous day-trip ideas around Heraklion: Stalis Beach (in Stalis), Lake Voulismeni (in Agios Nikolaos) and Malia Minoan Palace (in Malia). 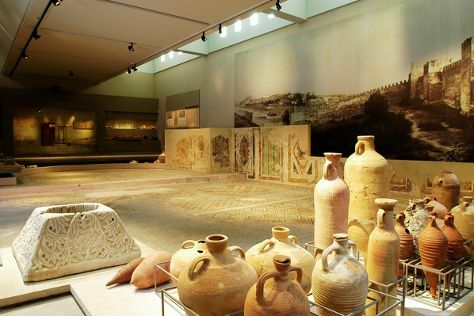 There's lots more to do: explore the ancient world of The Palace of Knossos, meet the residents at Cretaquarium Thalassocosmos, do a tasting at Douloufakis Winery, and get engrossed in the history at Historical Museum of Crete. To see ratings, maps, photos, and tourist information, refer to the Heraklion travel itinerary planner. Traveling by car from Mirtos to Heraklion takes 1.5 hours. July in Heraklion sees daily highs of 34°C and lows of 26°C at night. Cap off your sightseeing on the 2nd (Wed) early enough to travel back home.